What’s that strange noise coming from your cupboard? It’s certainly not a monster, but it could be that leaky, on its last legs boiler. Might be time to swap your old boiler for a more modern and more efficient one, which keeps your house comfortable and warm, rather than feeling like something from a horror movie! What’s that strange noise coming from your cupboard? It certainly not a monster, but it could be that leaky on its last legs boiler. Might be time to swap your old banger for a more modern and more efficient one which keeps your house comfortable and warm rather than feeling like something from a horror movie! 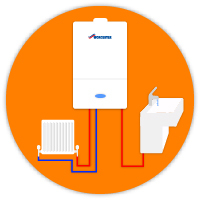 Combination or ‘Combi’ Boilers are one of the more efficient ways to heat your home and water. This is because Combis heat your water directly from the boiler, meaning your hot water is only warmed up when you need it. This is unlike a system or conventional boiler, which requires a water cylinder to ensure you have a consistent supply of hot water at all times, which wastes energy. A System Boiler is mainly geared towards heating your home and requires a water cylinder to supply a reliable source of hot water. The boiler tops up the hot water in the cylinder when it becomes low, but the cylinder itself will maintain a consistent water temperature throughout the day, which makes it less efficient than more modern combination boiler systems. Conventional Boilers are also known as ‘Traditional’ or ‘Heat Only’ Boilers. We would only recommend you have this boiler type if you already have a traditional heating and hot water system supported by a hot water cylinder and cold water tanks. This is because this system is less efficient than other boiler types, takes up more space and is more costly to maintain. A Combination or ‘Combi’ Boilers are one of the more efficient ways to heat your home and water. This is because Combi’s heat your water directly from the boiler meaning your hot water is only warmed up when you need. This is unlike a system or conventional boiler which requires a water cylinder to ensure you have a consistent supply of hot water at all times, which wastes energy. These prices are based on a like for like replacement of a Combination Boiler should you be looking to change from a System or Conventional boiler please contact us for more a more accurate price estimate. Need a website but need it done cheaply? A one page websites offer a unique solution! Give yourself an online presence with a simple but beautiful website. A System Boiler is mainly geared towards heating your home and requires a water cylinder to supply a reliable source of hot water. 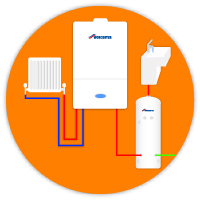 The boiler tops up the hot water in the cylinder when it becomes low, but the cylinder itself will maintain a consistent water temperature throughout the day which makes it less efficient than more modern combination boiler systems. These prices are based on a like for like replacement of a System Boiler should you be looking to change from a Combi or Conventional Boiler please contact us for more a more accurate price estimate. Conventional Boilers, sometimes known as Traditional, Conventional or a Heat Only Boiler. We would only recommend you have this boiler type if you already have a traditional heating and hot water system supported by a hot water cylinder and cold water tanks. This is because this system is less efficient than other boiler types, takes up more space and is more costly to maintain. These prices are based on a like for like replacement of a Conventional Boiler should you be looking to change from a Combi or System Boiler please contact us for more a more accurate price estimate. Feeling a little chilly? Turn up the heat in your home using a Honeywell Mechanical Thermostat! Make your home smart with a smart thermostat. Turn on your heating based on your location or using your phone and keep track of your energy usage. Use a heating timer to set when you want your boiler to turn on or off and at what tempreture! These prices are based on a like for like replacement of a Combination Boiler; should you be looking to change from a System or Conventional boiler, please contact us for more a more accurate price estimate. These prices are based on a like for like replacement of a System Boiler; should you be looking to change from a Combi or Conventional Boiler, please contact us for more a more accurate price estimate. These prices are based on a like for like replacement of a Conventional Boiler; should you be looking to change from a Combi or System Boiler, please contact us for more a more accurate price estimate. We will need to know a little more about your home so we can make sure you’re getting a boiler which will keep your house warm and your water hot, at the right price for you. So let us know when would be best for us to come over to do a quote! 1. What type of property do you have? 2. How many rooms do you have? 3. How many bathrooms do you have? 4. 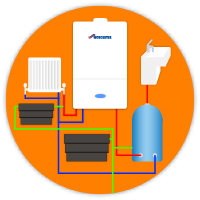 What boiler type do you have installed? 5. What boiler type do you want installing? 6. How many radiators do you have? 7. Where is your boiler located? 8. Where is your gas supply located? 9. Is your boiler’s gas supply within regulations? Once we have the answers to these questions, we will then talk to you about the options, giving you a chance to ask any questions and to give us an idea on what your preference may be. Normally a quote will take up to five working days to be sent to you. At this point, we encourage our customers to contact us to ask any questions that they may have. If you’re happy with your quote and you would like to book in to have your boiler changed, give us a call or click the button below! 4. Let The Work Begin! So the day is finally here! Time to swap out the monster in your cupboard for a brand new boiler! 1. Our engineers will typically be on your doorstep at 8:30 am and will be gone by 5:00 pm, but if this changes we will be sure to tell you in advance. 2. Boiler installations will take up to 2 – 3 days. 3. We try our best to limit downtime, but you may be without hot water and/or heating during this period. 4. We may need access to all the rooms in your home at one point or another; if there is somewhere you would like us not to enter, please let our engineers know. 5. All Done And Dusted! Boiler installed, check. Hot water, check. Warm house, check. Looks like the job is done. Minus one or two things. Once a job is finished, our engineers will always clean up after themselves; no dust or tools will be left to trip over! We will walk you through everything that we have done and show you how to use your new thermostat and boiler controls. 6. We Are Not Finished Yet! Once the job is done, we won’t just leave you to your own devices. We want to know how you are getting on with your new boiler! So we will give you a call from time to time to see how you are getting on! Don’t forget we will send you a Checkatrade review card – this really helps our business, so we would appreciate it if you could take a few minutes to fill this in and post it using the prepaid stamp provided! Don’t worry, we have got you covered! Being accredited means we can offer you up to 10 years guarantee for your boiler! 1. Can I Install A Boiler Myself? By law, any gas work carried out in your property must be carried out by a Gas Safe registered engineer who has had professional training. This is for your safety and we need to stress that any gas work carried out by you could be an legal offence. 2. What Does Gas Safe Registered Mean? Gas Safe, which used to be known as Corgi, is the official gas installer registry for the United Kingdom. All gas engineers need to be legally registered to Gas Safe to rubber stamp an engineers competency and safety as an installer. Every four years, gas safe requires that all registered engineer to participate in a number of checks and tests to ensure that they are still competent and safe to be installing gas products. We have full Public Liability Insurance which covers us up to a maximium of £2 million in damages. 4. Do We Offer Finance? Unfortunately, we do not offer finance services for any of our services at this time. By law, any gas work carried out in your property must be carried out by a Gas Safe registered engineer who has had professional training. This is for your safety and we need to stress that any gas work carried out by you could be a legal offence. Gas Safe, which used to be known as Corgi, is the official gas installer registry for the United Kingdom. All gas engineers need to be legally registered to Gas Safe, which guarantees an engineer’s competency and safety as an installer. Every four years, Gas Safe requires that all registered engineers participate in a number of checks and tests, to ensure that they are still competent and safe to be installing gas products. Let’s get that boiler Insalled! Bring your homes heating into the 21st century with a thermostat, which keeps your home warm when you need it to be!